We’re a family business, independent of any other organisation, established in 1997. We’re an environmentally aware company and are proud to have achieved ISO14001. Be reassured: with T&D Barrs you’ll receive unbiased advice, a fair price and quality workmanship. .. consistently. Our proven track record shows that we’re fast moving, thorough and customer focussed; essential ingredients for achieving results with every size of job. It’s our flexible, helpful approach that makes a huge difference to our clients. 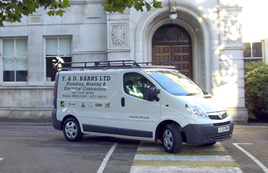 You can trust T&D Barrs for first class service from start to finish. You’re in safe hands. Our team is employed by us, with a fleet of 25 vans covering London and the Home Counties. Each person is DBS checked, with up-to-date accreditations and health & safety training.